Photo courtesy of DTX Street. High Vis and his DTX Street collective are creating some of the city's best street photography from way over street level. The photographer known as High Vis has harnessed the scenery of downtown Dallas and the influence of Instagram to spearhead a unique street photography movement. In less than 3 years, he’s amassed a following of over 21,000 accounts via his personal profile and the popular DTX Street photography collective he founded. Gritty, vivid, urban imagery along with eye catching compositions are staples of High Vis’s style. 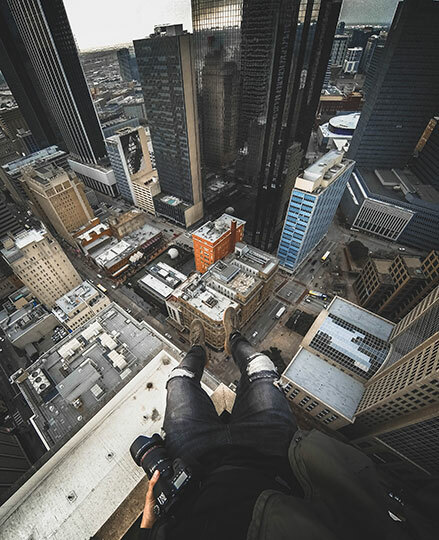 However, it’s the stunning aerial views of the city he captures via scaling skyscrapers, construction cranes, and abandoned buildings that have fueled the rapid growth of his fan base. He maintains some level of anonymity due to the fact many of his photos are not always obtained through, let’s say, proper legal means. Because of that, he doesn’t allow his government name to be shared. You’ll also never see a photo of him where full view of his face isn’t obstructed by a scarf, shades, a hat strategically placed just above his eyebrows. At times his camera is used as a shield. When High Vis moved to downtown Dallas the photography bug had firmly sunk its teeth in, and he was addicted to capturing all that his new surroundings had to offer. The moniker he adopted was short for “High Visibility” in the literal sense. The name, however, worked seamlessly into building his brand once he began taking the majority of his photos from high altitudes. “I just wanted my pictures to have a unique perspective. Everyone can get shots on the ground, but everyone can’t get pictures from rooftops and buildings where you’re not supposed to be,” he says. Exposure and creating inspired artwork is all fine and well, but High Vis never set out for this to just be a hobby. “I wanted to find a way to make money from something I love to do. People would laugh and say how are you going to make money doing this, and I’d tell them ‘Just wait, you’ll see,’” High Vis says. He’s been contracted as a social media influencer for ZTE cell phones, MSTR watches, and Yums, to name a few. In January DTX Street held its first gallery show, titled “D-Tour” and plans for another show are in the works for later this summer. The official DTX Street crew is comprised of seven core members, who are channeling their efforts into plans for a magazine. “Everything is going to be based around photography, but we’re going to cover music, art and other topics. The initial version will be online but we plan on having a print version as well,” he says. Time will tell if plans for new ventures can be executed, but the pieces are definitely in place for High Vis and DTX Street to be ambassadors for street photography in Dallas.